Brad Gushue’s quest to join the Tim Hortons Brier record book will face some significant roadblocks when the 2019 Tim Hortons Brier, presented by AGI, gets underway March 2 in Brandon, Man. Gushue and his team from St. John’s (vice-skip Mark Nichols, second Brett Gallant, lead Geoff Walker, alternate Tom Sallows, coach Jules Owchar) will be looking to win a third consecutive Canadian men’s curling championship; only Randy Ferbey’s Edmonton team, which won in 2001, 2002 and 2003, has pulled off the Brier three-peat. But standing in Gushue’s way will be some of the biggest names in curling as the world’s most famous national curling championship takes place at Westoba Place in Brandon for the first time since 1982. Back then, it was a Northern Ontario team skipped by Al Hackner that prevailed, and this year’s Northern Ontario entry, skipped by 2013 Tim Hortons Brier champion and 2014 Olympic gold-medallist Brad Jacobs of Sault Ste. Marie will be no less formidable. That can also be said of Kevin Koe’s Alberta champs from Calgary. Like Gushue, Koe has a chance to move into elite company with a gold-medal victory in Brandon. 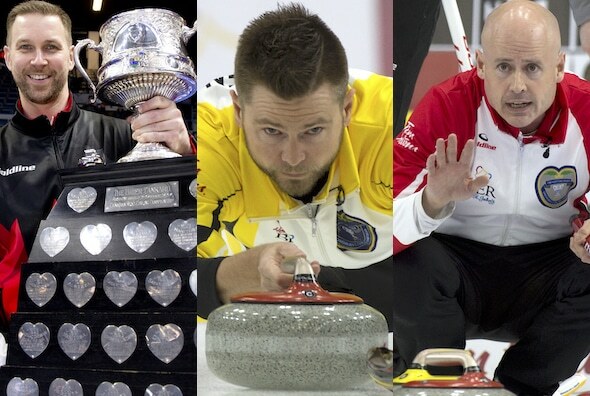 With past wins in 2010, 2014 and 2016, Koe can join Ferbey, Kevin Martin and Ernie Richardson as the only skips ever to win four Brier championships. Meanwhile, Brandon-born Mike McEwen will wear the Manitoba buffalo and will be the hometown favourite after winning his third Purple Heart on Sunday in Virden. 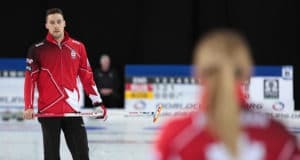 McEwen has taken over skipping duties for Team Carruthers, and will be looking to improve on the bronze medal he won with his former team at the 2017 Tim Hortons Brier in St. John’s. 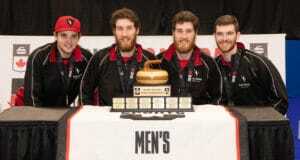 The feel-good story of the 2019 Tim Hortons Brier might be the Ontario team from Kingston, skipped by Brier rookie Scott McDonald. His team put together a perfect 11-0 run at the Ontario championship in Elmira, including three straight victories over defending champ and 2018 Tim Hortons Brier bronze-medallist John Epping of Toronto. Team McDonald has played 80 competitive games en route to the 2019 Tim Hortons Brier — the most of any team headed to Brandon. The 16th and final qualifier will be decided on Friday, March 1, as the Wild Card game (7 p.m., all times Central, TSN/RDS2) at Westoba Place will feature the top two non-qualified teams from the Canadian Team Ranking System (CTRS) — Edmonton’s Team Brendan Bottcher, the 2018 Tim Hortons Brier silver-medallist, and Team Epping. There’s no shortage of intriguing matchups to kick things off on opening weekend in Brandon — including the always-exciting Battle of the Prairies as Manitoba takes on Saskatchewan’s Kirk Muyres (Saskatoon) in the opening draw, March 2 at 2 p.m. 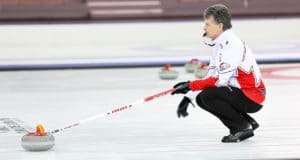 The home team is back in action twice on Sunday, taking on Quebec veteran Martin Crête of Saint-Romuald (who took over skipping duties with veteran Jean-Michel Ménard stepping away from competitive curling) in the morning draw at 9 a.m., and then a Sunday night showdown at 7 p.m. against Team Wild Card. Another big assignment for Manitoba will be a Tuesday night battle with Northern Ontario at 7 p.m. Team Canada, meanwhile, will kick things off in the evening draw of the opening day against Ontario; Team Canada also has a showdown with Alberta to look forward to in the Monday night draw — a rematch of the drama-filled 2017 gold-medal game in St. John’s. The pools are set based on the teams’ position on the CTRS as of Dec. 31; the winner of the Wild Card game will automatically have a No. 3 seed. Next: 2019 Scotties Tournament of Hearts gets underway Saturday in Sydney, N.S.